Today marks exactly two months since I began this online garden journal. It’s been a great learning experience I look forward to continuing. 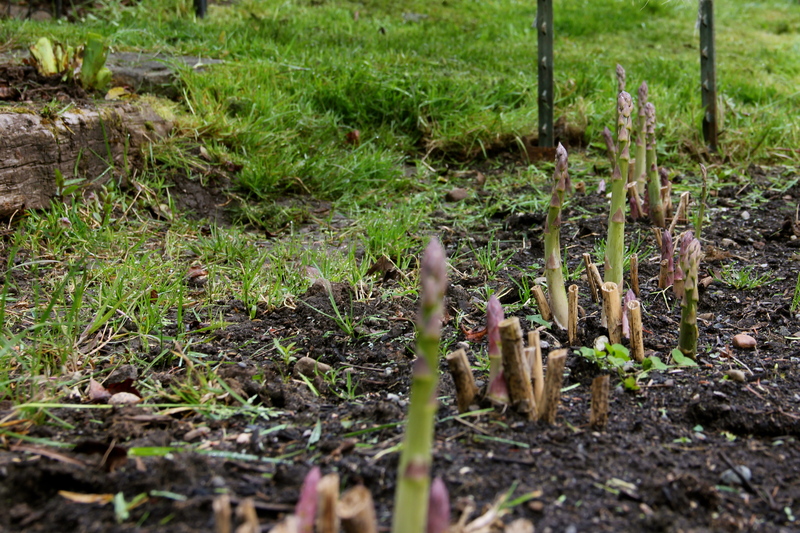 In completely unrelated news, we are enjoying eating the sweet asparagus as quickly as we can harvest it — about a dozen spears every few days. Acer macrophyllum, bigleaf maple trees, dot these acres. During this time of spring it’s easy to spot the trees, as they are covered in bright green, pendulous racemes which hang below the young leaves. Some of the trees have multiple trunks, and many are between 50 and 100 feet tall. Since we moved in mid-January when deciduous trees were bare, the way we were confident we had maples was by raking up their huge leaves. They are also called broadleaf maples since their leaves can reach over a foot wide. Bigleaf maples host several epiphytic plants in this moist climate — plants that grow on other plants which they depend on for structural support but not for nutrients — including mosses, lichens and ferns. They are valuable shade trees and also offer erosion control, habitats and food for wildlife, and beauty. Almost all marketed maple syrup is made from Acer saccharum or sugar maples which don’t grow in the Pacific Northwest. 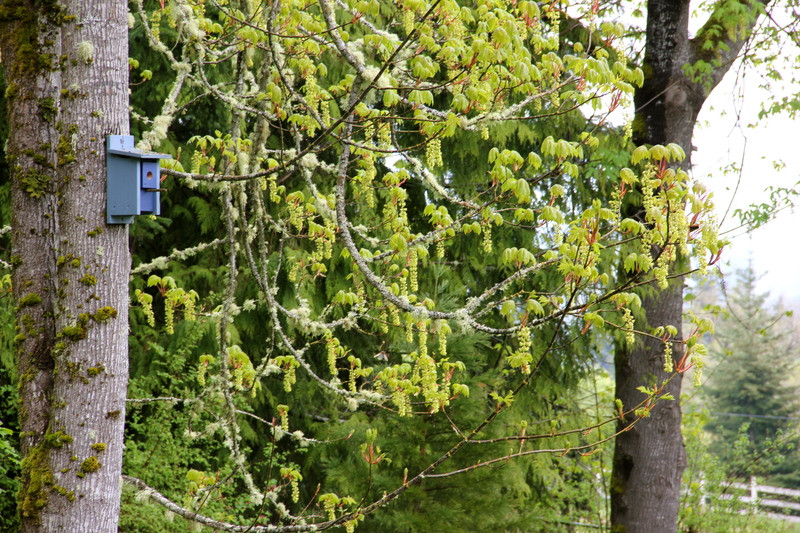 In researching maple syrup, I’ve learned that it is possible to make syrup from our bigleaf maples, and I’ve enjoyed perusing the adventures of one northwest man who is an expert at foraging: http://arcadianabe.blogspot.com/2014/03/bigleaf-maple-sap-running-strong.html. With all else going on at Coppertop, I have no immediate plans to dabble in maple syrup production, although everyone in our family enjoys it. It takes 40 gallons of tapped sap to make just 1 gallon of syrup. Trees other than maples can be tapped, but the flavors often disappoint. A great joke in Canada, a country rightfully proud of their abundance of maples, refers to tapping telephone poles, with the result being Pole Syrup – also known as imitation syrup such as Aunt Jemima, Log Cabin, or Mrs. Butterworth’s. 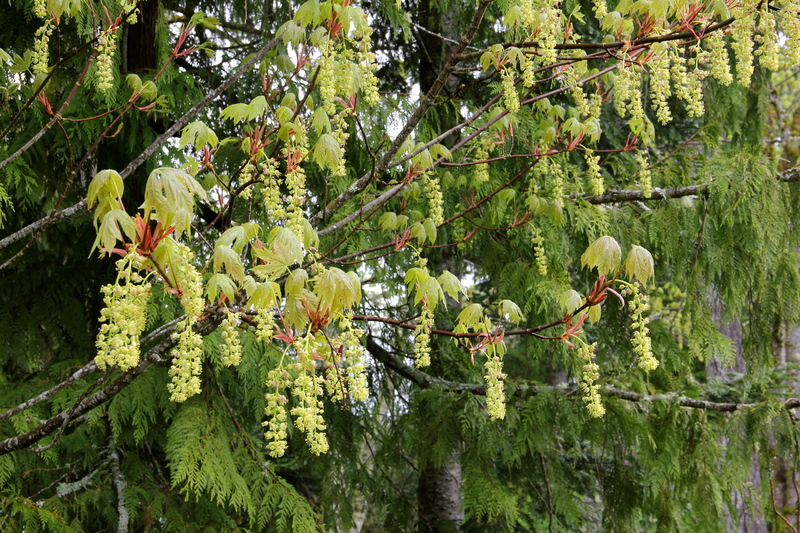 This entry was tagged acer macrophyllum, asparagus, bigleaf maples, epiphytic, gardening, Olympic Peninsula, Pacific Northwest, racemes, trees, wideleaf maples. Bookmark the permalink.